Nothing can be more secure and peaceable than a journey on the Nile, as everyone knows nowadays. Floating along in a boat like a house, which stops and goes on whenever you like, you have no cares or troubles, but those which you bring with you. ... I can imagine nothing more delightful than a voyage up the Nile with agreeable companions in the winter, when the climate is perfection. There are the most wonderful antiquities for those who interest themselves in the remains of bygone days; famous shooting on the banks of the river; capital dinners, if you know how to make proper arrangements, comfortable quarters, and a constant change of scene. There is a profound charm in this landscape; a beauty that grows slowly upon you. The climate also indisposes you for violent contrasts and excitement, you fall in with the prevailing tendency to the tranquil and solemn. All seems to harmonise with the inner impression of Egypt on your mind. And although as to mere size there exists nothing here to emulate the majesty of Alpine scenery, there is nevertheless a pervading sentiment and admixture of the sublime. A feeling of mystery may explain this. Looked upon from that point of view, no scenery, save perhaps the awful group of Sinai, can be grander or more severe than this; for the element of mystery tinctures everything in Egypt. Every vestige of its architecture, too, that you meet adds to the feeling. A great critic speaks of structures characterized by ‘a severe and, in many cases, mysterious majesty, which we remember with an undiminished awe, like that felt at the presence and operation of some great Spiritual Power.’ That is eminently true of the great piles of Egypt. Somehow you instinctively speak low when the Great Pyramid looms into sight. I have seen laughter stopped in an instant by that unexpected apparition. Gradually, as you travel on, you come to perceive from whence spring the first glimmerings of Egyptian art. The relation of art to nature is nowhere so strongly marked as here. It was the landscape, ever rich in tropic beauty, the sweep of the majestic river, the eternal silence of the desert hills, that engendered in the minds of the early Egyptians feelings which were developed in their art. Most of what you now discover of mysterious yearning, of calm power, of pathos, of stability, as suggested in the paintings, sculpture, and architecture of Egypt, was first mirrored on the artist’s soul by a contemplation of what he saw around him. This is manifest even in respect of outward form. The grand ideal of the Egyptian temple is to be found in the stratified cliff. On that fantastic wall you may define pylons, porticoes, pillared arcades without number. A very dull imagination might there build up temples grander than Karnak and more colossal than the pyramid. A chamber cut in the rock, vaulted as the heavens are vaulted, and sown over with golden stars on a field of azure that was the beginning of all architecture. The very earliest column known is a twisted sheaf of water-lilies, of which the closed flowers form the capital, while the shaft was wreathed with paintings of the same. 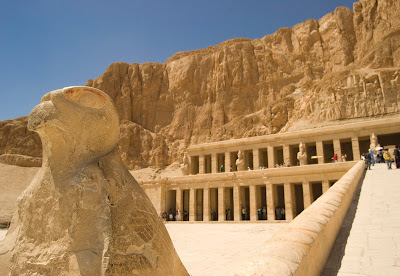 Lastly, by the pillar side, the artist placed Man, the master or rather his representative, Osiris shrouded and silent, bearing in his folded arms the symbols of power and judgment, but speechless. Nature could tell no more. You can never in your thoughts detach the Egypt of the past from the Egypt of today; neither, indeed, can you ever quite exclude it from sight. Temples, scattered ruins on the plain, tombs sown thick along the mountain cliff on either hand, arrest your eye in succession. And with every thoughtful mind this undercurrent of feeling, as regards the past, must tincture the landscape with colourings of its own. It is a background never lost sight of. The incidents of the near landscape, those change, but that travels on with you. From the pyramids which stand as man’s handwriting upon Egypt, his autograph which Time cannot obliterate onward to far Syene [Aswan] it is there.